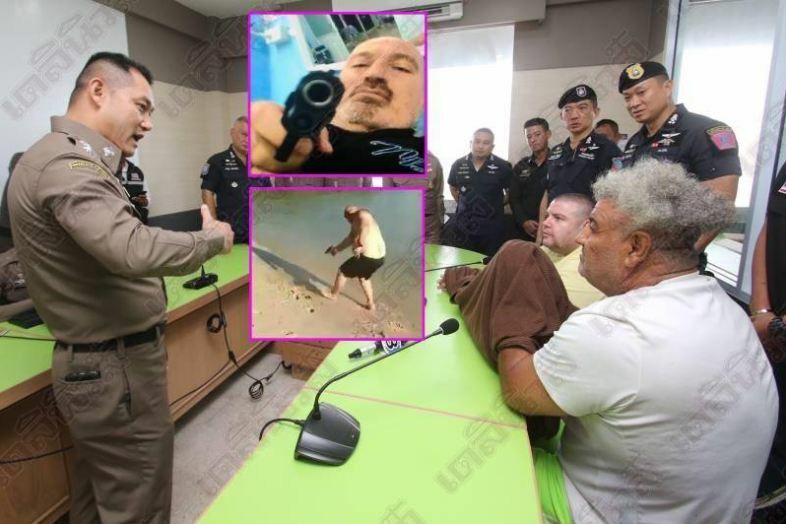 Thai police have announced the arrest of several Israelis wanted in Thailand and abroad on weapons, murder and extortion charges. Several of the men were seen in the videos shooting in the air and at what looked like fish, crabs or shellfish on the beach at Koh Samui. Among the arresting team was deputy commissioner of the tourist police bureau who said that one of the men – Shalom Fima or Ego – was wanted in Israel for threatening behaviour, abduction murder and extortion. Another caught shooting on the beach was Ori Levy who unloaded 12 shots from a gun into the air and into the sea. they were arrested at Koh Som beach, Bo Phut. They claimed the gun used was a BB gun – something the police who have a witness believe to be nonsense. They are part of the same group as “Netty” or Netanel Hadad, 64, who was arrested earlier, said Daily News. Both Levy and Fima are wanted in Thailand for extorting money from their countrymen on Samui. Another video shows a man believed to be Israeli Lior Saat. Dressed in shorts and sunglasses on a beach he takes aim and fires 12 shots at something in the sand. He appears pleased with himself. Another video is said to be an extortion attempt. Among the arresting team was deputy commissioner of the tourist police bureau who said that one of the men – Shalom Fima or Ego – was wanted in Israel for threatening behavior, abduction murder and extortion.